This Gilded Nola Arabella 1 light duo mount mini pendant in distressed gold finish features New Orleans style and can also be mounted as a semi flush ceiling light as shown. Boasting a circular ceiling mount, height adjustable rod suspension and 17cm cylinder shade constructed from distressed gold precision cut metal, with inner cream fabric shade that softens the light beautifully. A wonderfully extrovert ceiling pendant or semi flush that makes a lavish statement. Ideal lighting for any room in your home and particularly suited to over a table in kitchen and dining areas, singly or in multiples, including rooms with a low ceiling. Supplied with one 7.5cm, two 15cm and two 30cm rods that can be used singly or in any combination to achieve the desired drop; please see the technical information below for exact dimensions. 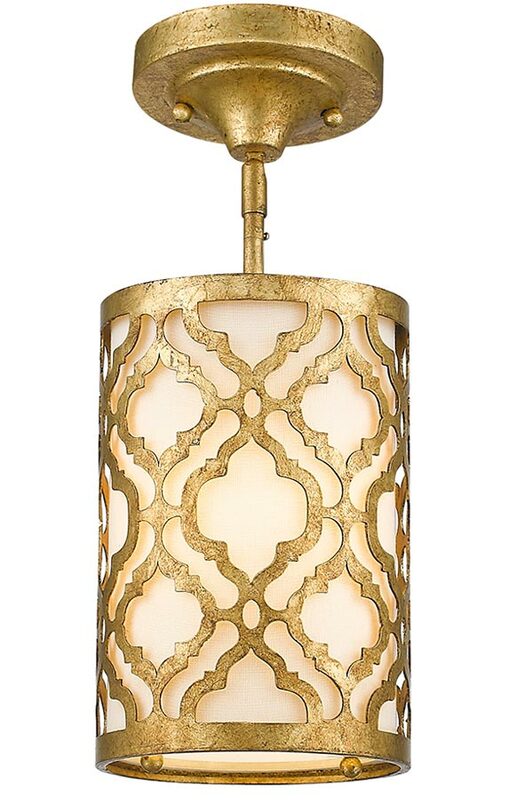 There are matching fittings in the Arabella lighting range in distressed gold finish; please see below. This sophisticated light is designed in the USA by Gilded Nola. They are inspired by the decorative elements of New Orleans and are famous for their abundance of unique styles such as the Arabella 1 light duo mount mini pendant in distressed gold finish you see here.